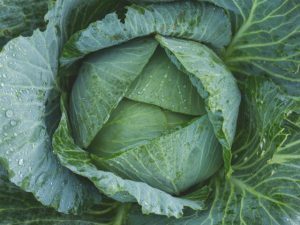 Cabbage is grown in Florida during the cooler months and is relatively easy to grow if you follow these basic tips. Gardeners can easily start plants from seed. If you getting a late start, consider purchasing transplants to cut out about 4 weeks of growing time. If transplants look slightly leggy (stretched) they can be set deeply so that about half of the main stem is buried in the ground. Cabbage plants need a steady supply of moisture and fertilizer to produce good heads. It’s best to use a time-released granular fertilizer at planting and install a drip irrigation system on a timer to regularly provide small amounts of moisture to the root system. In addition to the slow-release fertilizer, plants benefit from light liquid feedings once new leaves begin to develop and when they start forming heads. Watch for leaf-feeding caterpillars which can be devastating to a cabbage crop. The head is ready to harvest if it feels firm when squeezed. If you’ve had trouble with cabbage heads splitting in the past, you can take steps to avoid it this season. Splitting is caused by the pressure of excess water taken up after the heads are solid. Often, this occurs following a rain event. Providing small, steady amounts of water through drip irrigation will help prevent splitting but there is another method. Cutting the roots with a shovel or spade on two sides of the plant, or breaking the roots by lifting and twisting the head to one side may reduce splitting. But since the cutting and twisting also damages the plant, be prepared to harvest within a week before the head starts to go bad. For more vegetable gardening information, including recommended varieties for Florida, see the Florida Vegetable Gardening Guide.